The Mariinsky Palace was built between 1839 and 1844 after the design of the architect Andrey Stakenschneider for Maria, the daughter of Nicholas I. The building was commissioned by Nicholas I when his daughter married the Duke of Leutenberg. In 1884 her descendants sold this palace to the Ex­chequer. Between 1906 and 1907, the palace was re­built. This structure became the seat of the State Coun­cil. The State Council was the supreme legislative body of the Russian Empire. The palace was constructed in the classical style. The architect revealed a lot of fantasy designing the interior decorations of the palace. From the vestibule of the palace an elegant white marble staircase leads to the first floor. The staircase is embellished with the sculp­tures of ancient warriors. The reception room is deco­rated with pilasters of dark Crimson Italian marble and sculptured frieze with episodes from Homer’s Iliad. The rotunda of white marble with Corinthian columns dec­orates the most spectacular room of the palace. Behind the rotunda till 1906 there was the winter garden. 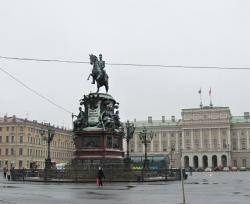 At present the Mariinsky Palace is the seat of the Legisla­tive Assembly of St Petersburg. In front of the palace the monument to Nicholas I was erected in 1859. The equestrian monument to Nicholas I was inaugurated four years after his death. After ascending to the throne. Nicholas I suppressed an attempt to stage a coup d’état. This armed uprising is known in history as the “Decembrists’ uprising”. The author of the design of the monument was the famous architect Auguste Montferrand. The figure of the horseman was modeled by the outstanding French sculptor Pyotr Klodt. This 6-metre high monument is an example of an equestrian statue on two points of supports. The tsar is depicted in cavalry uniform and a helmet bearing an eagle. The rider is sitting proud and haugh­tily. The sculptor conveyed the tsar’s love for military exercises, his vanity, cruelty and arrogance. The pedestal of the monument is decorated with bas- relief. Four allegorical figures on the pedestal symbolize Wisdom, Might, Justice and Faith. Their faces have the portrait resemblance to the wife and three daughters of the Emperor. The allegories were performed by the sculptor Robert Zaleman. Between the figures of Might and Justice there is a state coat of arms and the super­imposed bronze inscription: “To Nicholas I the Emperor of Russia, 1859”. Four high reliefs on the pedestal represent individual events in Nicholas I’s ruling: his speech before his courtiers after the Decembrists’ revolt was put down; the putting down of the cholera riot in 1831 when the Emperor, riding in an open cab drove into the infuriat­ed crowd and shouted: “On your knees!” and the crowd obeyed; Nicholas I’s inspection of the bridge at the con­struction of the railroad between St Petersburg and Moscow; the awarding of Mikhail Speransky for the publication of the Code of Laws of the Russian Empire in 1832. These high reliefs were created by the sculptors Nikolay Ramazanov and Robert Zaleman.